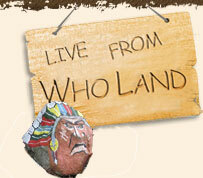 We obviously didn't start this bit of madness called wholand.com to try to make a buck. On the contrary it costs quite a bit to keep it running every year. From the domain, to the website, to the server, it all costs money. When we first went live we had a handful of hits a month, today we get hundreds of hits a day consuming lots of bandwidth. We started with a couple dozen pictures and now have several hundred hogging up disk space. Never mind the software or the countless hours building and maintaining it. So if you have a buck to spare, we will graciously accept it, if not, no worries. You can purchase Who Bucks of course. One US dollar will get you one Who Buck. Who bucks don't have any cash value but their good for trade while visiting Wholand. Just select your denomination from the pull down and click on the "Buy Now" button.